If you are the one responsible for keeping your garden well-manicured, then having a gas hedge trimmer is practically necessary. While there are various sizes and types available, gas-powered models have an edge on many competitor products. The best gas hedge trimmers are much more powerful and portable, which is a huge reason why both professionals and beginners prefer them. But how do you determine which ones are the best? You need to look at various features that each one has but may differ a bit. The engine size is important, as it directly relates to the power a hedge trimmer provides. The blade will vary with its length, weight, quality, and whether it’s dual or single-sided. Obviously, you’ll need to look at how portable it is, as you’ll be moving around with them. During our research, we also took into consideration how loud the hedge trimmers were. It’s important to know that gas-powered models are typically louder than battery or electric-powered ones. We spent quite a bit of time finding the best gas hedge trimmers on the market today. Days were spent testing out each one that went into consideration to ensure we’d truly selected the best. Below, you’ll find a table where you can easily compare-and-contrast each selection. After that, you’ll find in-detail reviews of each product, and finally, a buying guide to ensure you’re selecting the perfect trimmer for you! Let’s not waste any time, though. Without further ado, we present to you the best gas hedge trimmers! The Husqvarna 122HD60 is ranked among the best professional gas hedge trimmers and is one of the most pleasant products we used. While it does come with a rather steep price tag, if you’re looking for true quality, this one can’t be beaten. Powered by a 21.7cc engine, it’s not only powerful, but great on gas usage. We noticed that the motor was easy to start up thanks to the Smart Start engine, the carburetor air purge, and is a very low-maintenance trimmer. The best rated gas powered hedge trimmer also has a stop switch that automatically returns to the start position when the machine is powered off, to make it easier to start up. Another hugely convenient feature of the model is the adjustable rear handle. This is perfect if you need to cut the sides and top of hedges, and the twist handle lets you keep both of your hands in a comfortable place, stand straight, and still have a good amount of leverage on the hedge trimmer. The machine is surprisingly lightweight considering how powerful it is, and the blade is also notably sharp, making it even more convenient, safe, and accurate with trimming. Finally, the anti-vibration dampeners work to absorb the vast majority of vibrations, reducing stress on your arms and hands. Given the price tag, not everyone will be able to afford this machine, but if you can, we highly recommend it. It’s definitely worth the investment, given how durable it is, and how well it performs. It will outlast most machines that are less expensive, and perform much better, so if you’re willing to shell out a bit more, definitely do it! The ECHO HC-152 is another one of the top, upscale gas hedge trimmers out there. The trimmer is perfect for both beginners and seasoned landscapers alike, due to how easy and convenient it is to operate. The 21.2cc engine is quite powerful and needs 50 parts gas to 1 part two-stroke oil. It also holds over 15 ounces in the see-through fuel tank, which is nice, as you can see when you need to refill, and the ample size lets you work in large areas for quite a while. While it really only weighs a pound more than our last product, we did notice the weight increase in the ECHO. If you’re already accustomed to electric trimmers, you may find it a bit more difficult to use, but you shouldn’t have issues getting used to it. While the name does relate to sound, we’d like to note that this hedge trimmer is definitely not noisy, thanks to the muffler which works to lower noise, while directing emissions away from you while using it. The blade isn’t necessarily short, but it is shorter than some other trimmers, which can make cutting a bit longer. However, the shorter blade will give you more control and balance, making it perfect for topiary and formal landscaping. The trimmer features a large hoop-type front handle, along with an ergonomic rear handle, making it extra comfortable and easy to maneuver. However, we would’ve liked to have seen an adjustable or rotating rear handle for even more ease of use. With nothing to absorb the vibrations, this can so make it more of a challenge to control, and more exhausting on the muscles. Designed with the needs of the professional landscaper in mind, the Tanaka TCH22EBP2 features a powerful two-cycle, 21.1cc engine, while also providing max efficiency with reciprocating and 20-inch dual-edge, commercial-grade blades for consistent, quick cutting. Despite having such a powerful engine, it’s one of the most lightweight gas hedge trimmers we’d found, weighing in at 9.4 pounds. That makes it much easier to maneuver, particularly if you’re lifting it over-head. If you’re worried about fatiguing before you get done with your work, the light weight of this hedge trimmer will really make a difference. While it may not absorb vibration, it still helps out quite a bit. The PureFire engine goes off of a 1-2 cycle oil/gas mix, which is, again, powerful, but is also incredibly fuel-efficient, which is good for you and the environment. Blade length is relatively short, although you can opt for one of the two other, longer options, if you’d prefer. The 5-position rear handle does allow for a good amount of comfort and flexibility, as well as boosting safety, as you don’t have to stretch into uncomfortable, unbalanced positions to try and trim properly. The forward-facing, angled exhaust is also helpful, as it’s angled away from you, so you don’t have to worry about inhaling any remains. So, were there any downsides to it? Well, aside from there not being any vibration absorption, it’s not the most durable gas-powered hedge trimmer we’ve seen. In fact, we noticed it wasn’t all that easy to start many times, and with many plastic parts, it was only a matter of time before it started to lost some of its durability. It does have many wonderful features, but it’s important to keep this in mind. The Poulan Pro Hedge Trimmer is one of the best gas hedge trimmers for the money. With a 23cc, full-crank, two-cycle engine, it’s definitely powerful enough for anything you encounter, while being user-friendly, and great for using on all kinds of shrubs and hedges. It’s also quite easy to start, which makes it good for beginners and those who may not be as strong as they used to be. The blades are a good length, at 22 inches – neither too short nor so long that control would be difficult to manage. They’re made of stainless steel, so you can rest assured they’re durable, and they’re dual-sided, cutting limbs up to 1 inch in diameter. 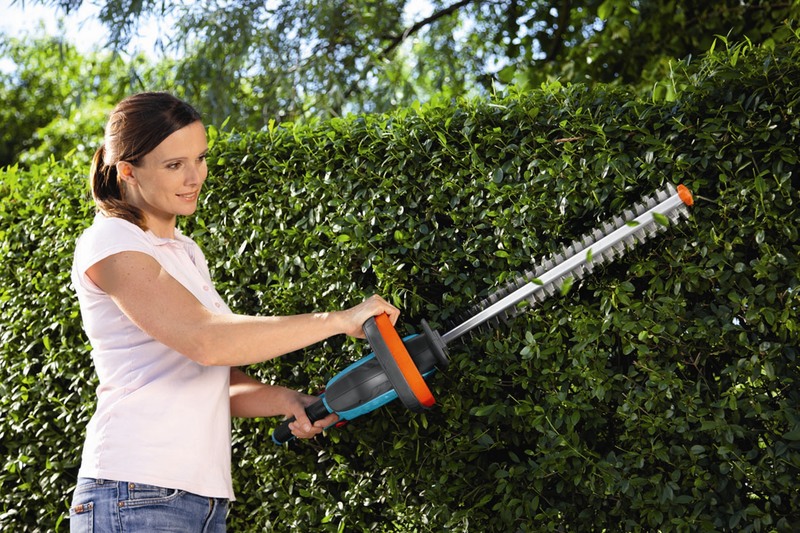 For a gas hedge trimmer, it’s an average weight, so it’s relatively easy to manage. With anti-vibration technology, you’ll experience more comfort and reduced fatigue, and the rotating rear handle with a comfort grip just adds to that. This makes it easy to cut and trim at just about any angle or position; whichever way you feel most secure and stable. You may be wondering, “If it’s so perfect, why is it considered the best budget product?”. It has many excellent qualities, but it isn’t on the same level as our best overall product, for example. This is primarily due to the cheap plastic parts with the trigger/rotating handle lock, and the relatively poor seal where the fuel line/tank is. While the majority of the products do well, there have been some users who have reported the plastic breaking after a few uses, or the fuel leaking. We personally had a good experience, but it’s definitely something to take into consideration. Choosing the best residential gas hedge trimmer, or professional product, isn’t always the easiest thing to do. There are so many variables to take into consideration when making your purchase, and if you’ve never used one before, the confusion is two-fold. That’s why we’ve decided to take it upon ourselves to create a handy buying guide, so you know without-a-doubt, that you’re selecting the best product for you and your goals. Gas hedge trimmers have plenty of benefits in comparison to others. Gas-powered trimmers are much more powerful, and are generally able to cut through thicker branches than electric options. Not only are they more powerful, but they’re also often quicker, which means you can spend less time trimming, and more time relaxing. They don’t require any cords or outlets, making them extremely convenient, easy to maneuver, and can be used just about anywhere – even in wet weather. They’re not perfect, though. Gas-powered hedge trimmers are notably heavier than electric or battery-powered ones, making them harder to maneuver, and making for quicker muscle fatigue. They’re also not typically emission-free, which isn’t exactly eco-friendly. Due to the additional power and required fuel supply, they can also be costlier. As you can see from the detailed reviews above, there are a few features you’ll want to consider when choosing the best gas hedge trimmer for home use. We’ve gone ahead and described each one of them below, so you don’t miss anything. The engine is an extremely important aspect when choosing the best gas hedge trimmer for you. The engine is almost exclusively related to how powerful the trimmer is. While you may not need as much power as other users, it’s always a good idea to have more, rather than less. While engine sizes differ exponentially, models that have an engine size of at least 20cc are more than enough for home use. However, if you require something for a large hedge or for professional use, definitely get something larger. This will also depend greatly on how large your hedge is. If you have a large hedge, you’re going to be spending more time outside, which means you’ll be using more fuel. You probably don’t want to have to haul your machine all the way back to fuel it up again, then haul it back out to get the job done, right? With that being said, it’s definitely smart to opt for a trimmer with a larger fuel capacity. Blades are another huge feature to consider when making your decision. You’ll want to look at the length, durability, weight, as well as if it’s single-sided or dual-sided. Ideally, you’ll want to go with a stainless steel blade, which is naturally hypoallergenic, as well as much more durable. Dual cutting edges and increased sharpness means you’ll get maximum performance, as well as easier use. The length of the blade will depend on your preference, as well as what your hedge looks like. Longer blades are much better for reaching higher places, but also tend to make the hedge trimmer heavier, and can be more difficult to maneuver due to trying to balance. While the products on our list don’t vary much in weight (around 2 pounds, maximum), they are generally much heavier than battery-powered or electric hedge trimmers. While the gas-powered hedge trimmers are all around the same size, also keep in mind that even a pound can make a difference when you’re using it in odd positions, such as over your head. Really be honest about your strength and stamina, so you can keep yourself safe, and your hedges looking their best. As far as warranties go, a 5-year residential, 2-year commercial warranty seems to be the standard. However, there are a couple products on our list that only come with 2-year warranties. The Husqvarna is one of them, and in this case, we felt that the 2-year warranty is okay, given how well-constructed and high-quality the trimmer is. The Poulan Pro also has a 2-year warranty, however, it isn’t as durable as the other, so use your best discretion on this one. How to use a gas hedge trimmer? A gas hedge trimmer requires that you fill it up with fuel, pull to start, and use it, similarly to a more mobile lawnmower, if you will. They feature blades that are constantly moving, to slice and trim away, shaping the hedges how you please. They require a good amount of strength and stamina, due to the heavy vibrations that come from it. As they’re so easily portable, they can be carried onto the job site, or through your yard without having to worry about a battery dying or the length of the power cord. How to maintain a gas hedge trimmer? Regular maintenance is required if you want your gas hedge trimmer to last. First, you’ll need to clean the blades regularly, as trace amounts of sap will accumulate on them, affecting the efficiency of the cut. You’ll also need to sharpen and lubricate the blades regularly to create a protective barrier. In addition, the air filter must be cleaned so airflow isn’t reduced, which can then lower engine power. Always make sure to tighten any loose screws or fittings regularly by using the proper screwdrivers and spanners. Finally, always keep the exterior clean with a lightly dampened cloth, and store your hedge trimmer in a waterproof, UV-resistant area. In addition to maintenance, always make sure to keep your clothes and body parts away from the blades. Even though you might be comfortable with it, this is crucial. Always wear tighter clothes, gardening gloves, ear protectors, and safety glasses. Make sure to swing away from your body, and keep both hands on the trimmer at all times. Are gas hedge trimmers more powerful than electric or battery-powered ones? What oil do I need to use with a gas hedge trimmer? And how often? You’ll typically use a 50:1 gas to oil mixture. How often, will depend on how long you’ll use your hedge trimmer for. How much time will it run on a full tank? Typically, they’ll run for at least a couple of hours. Can a gas trimmer cut dry twigs instead of green ones? Yes, since they are more powerful. While we loved all of the products on our list, our top three were the Husqvarna 122HD60, the Echo HC-152, and the Tanaka TCH22EAP2. The Husqvarna is extremely high-quality and easy to use, with minimal vibration, a rotating rear handle, and a powerful engine. The Echo is also quite powerful, exceptionally portable, and has an ergonomic handle for added comfort, while requiring little maintenance. Finally, the Tanaka is the quietest we tried out, is also well-constructed, has very long, dual blades, and a powerful motor. So, which of these best gas hedge trimmers will you be taking home?